Most people who like Mark Knopfler might know Chris Rea, who has been popular especially here in Europe since the 80ies. Due to health problems, he ended his active career some yeasr ago. I first heard of him in 1983 when a friend of mine who was also into Dire Straits at that time told me about a concert he was at with the then super-group SAGA. 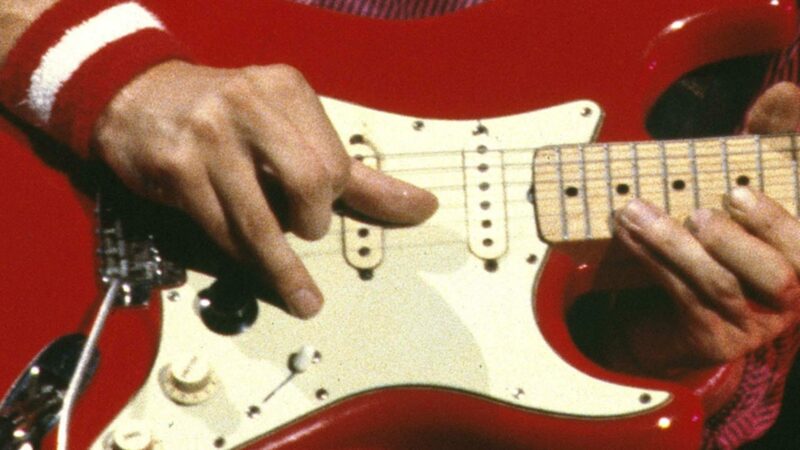 It seemed he did not like them that much, but he was enthusiastic abouth the support act that noone had heard of before, a guy who played a clean guitar sound similar to Dire Straits on an old fiesta red Stratocaster: Chris Rea. It was the same week when Rockpalast broadcasted a Chris rea concert from a small club in Bochum (very near to the place I lived then here in Germany), so I did not miss this concert (and even taped it with a cassette tape – this was before people had video recorders). I recently found a few clips from this and other concerts concerts on youtube and want to share them with you. The first track was the first one of the concert, so the first I ever heard. It is called “Nothing’s happening by the sea“. Chris plays his red Strat which is tuned to open E through a clean silver-face Fender Twin Reverb (and a brown Fender Bandmaster for distorted sounds).The bass is also cool: a fretless Steinberger, note how it interacts with the guitar licks. Unfortunately the uploader of this clip disabled embedding so I cannot show it directly here on this site, instead click here to open it in a new window on youtube. A second early track that never made it to a hit is Candles. This time Chris plays a Strat in standard tuning. This clip is from an open-air Rockpalast concert on the famous Lorelei Rock above the river Rhine in Germany, a place where Dire Straits also played on a festival in 1979. And finally, one of my all-time favorites of Chris’ setlist, the song Steel River from the same concert as the one before. It is amazing how the song develops through different stages from a slow ballad to the rock outro. Also that break at 4:30 is pretty cool. Have fun! Thanks for these. Some great rare videos of Mr Rea in action are now all over You Tube. He has some lovely Strats, mainly using Pinky and Bluey two 60’s Fiesta Red and Daphne Blue models. My two fetiche musicians for more than 20 years have been Mark Knopfler and Chris Rea. I owe the former learning to play the guitar and the latter the passion for music. But I have to say that they have evolved differently, though both have returned to their root music: country and blues. Nowadays I feel MK later performing and creativity is much less passionate than CR’s. To sadly say, rather boring. Ingo, Mr. Rea is not retired yet: to know what I mean you should listen to recent albums like “The Blue Jukebox”, “Stony Road”, and specially recommended: the only live CD “The Road To Hell & Back” (better the two cds edition) and the MONUMENTAL music-book work “Blue Guitars”: more than 130 original songs (not covers) spanning the whole blues spectrum with artwork and blues history comments by Rea himself, something unprecedented by any other musician. Listen to recent live performances and you shall get amazed of the fierce guitar work in songs like “Somewhere Between Highway 61 & 49”, “Dancing Down The Stony Road” and “Easy Rider”. That’s true passion for living and music in a seriously ill man. As I write this Chris Rea is touring Germany and it looks like he has been touring for awhile. 1) Not One Bad Thought – amazing ‘Imelda’ type MK soloing on TJW’s Uncovered album. 2) Foreign Affair – shared lead on title track of Tina Turner’s album (where I first discovered MK and TJW). MK plays subtle super clean ‘bend and hold’ Strat licks in the breaks (slightly left of centre) against TJWs slightly thicker, more blues based approach (centre right). You have to listen hard but it’s well worth it. Have you heard these? For anyone interested Closer To The Truth and Path of a Decent Groove are classic TJW albums most similar to the style of music on this site. Another one well worth watching for the live slide solo (including Chris’ trademark high notes waaaaaay beyond the frets, up by the bridge p/up) is the footage of “Working On It” from the Arsenio Hall show in 1988. Another proper Rea rock track…! There’s another version of the same performance also on YouTube – this one’s from Warner Music Video (CR’s label at the time) – it has much better sound but can’t be embedded. Worth a look.